“I should like to address directly my brothers and sisters in the Catholic Church, in order to remind them of their serious obligation to care for all of creation. The commitment of believers to a healthy environment for everyone stems directly from their belief in God the Creator, from their recognition of the effects of original and personal sin, and from the certainty of having been redeemed by Christ. Respect for life and for the dignity of the human person extends also to the rest of creation, which is called to join man in praising God (cf. Ps 148:96). “In 1979, I proclaimed Saint Francis of Assisi as the heavenly Patron of those who promote ecology (cf. Apostolic Letter Inter Sanctos: AAS 71 , 1509f.). He offers Christians an example of genuine and deep respect for the integrity of creation. 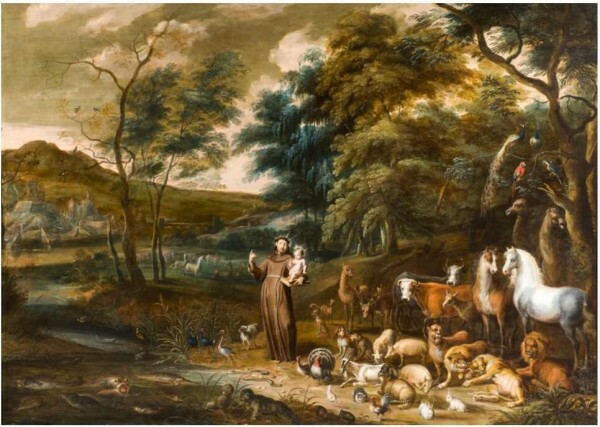 As a friend of the poor who was loved by God’s creatures, Saint Francis invited all of creation—animals, plants, natural forces, even Brother Sun and Sister Moon—to give honour and praise to the Lord. The poor man of Assisi gives us striking witness that when we are at peace with God we are better able to devote ourselves to building up that peace with all creation which is inseparable from peace among all peoples. –from Pope John Paul II, Message of His Holiness Pope John Paul II for the Celebration of the World Day of Peace: Peace with God the Creator, Peace with all of Creation, 1 January 1990, paragraph 16.